A while back, I took our children to our local Naidoc Celebrations. I think it's important to learn about our Indigenous Australians, their culture and to celebrate their achievements. I came across a stall of beautifully woven products, both tradional and modern. After speaking with one of the stall holders about their craft, I knew I wanted to have a go. 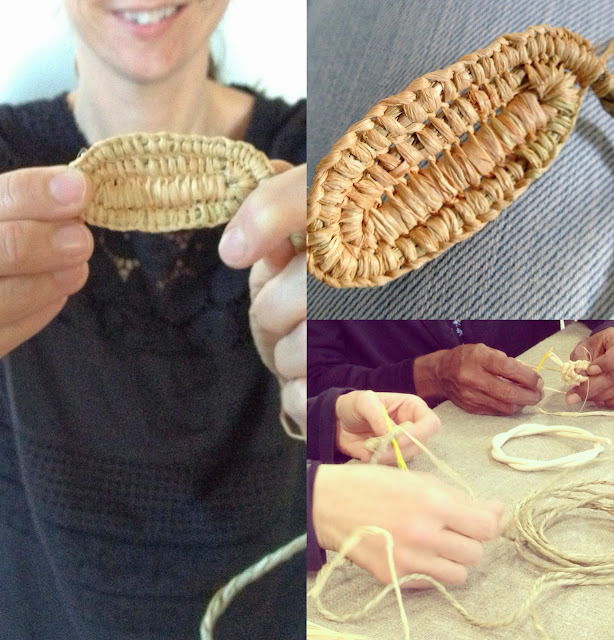 Yesterday afternoon I had my first weaving lesson with a beautiful and talented group of Indigenous women. It was very informal, sitting around, weaving and 'having a yarn' over a cuppa and a bite to eat. I came away so inspired and so thrilled to have made a start on my weaving. Their work is amazing-you can see it here. Hours of weaving goes into making each piece. I have a long way to go with my piece. The skill and speed of the women is AMAZING! What am I making? Well I am not quite sure yet. The piece just kind of evolves and shapes depending on how our hands connect with the materials. So we shall just have to wait and see I guess. It was so lovely to be mindful of my hands and their work, connecting with the women and learning something new and wonderful. As you can see, I have a long way to go but watch this space! Have you ever tried your hand at weaving? Have you been learning anything new lately? Oh! You are so fortunate! I would love to do exactly this - the women, tea and yarning included. I've only started playing with coiling at jome recently, with fabric scraps and thrifted string. I'll be keeping an eye out to see how your gorgeous weaving progresses! I haven't tried weaving before but I really want to. there are some lovely pieces that I've seen lately- i like the look of natural coloured rope and bright coloured cord. It looks very neat! I wonder what it will reveal itself as. I loved watching the Maori women weaving cloth in Wellington. So lovely to keep the traditional practical crafts alive! Oh I'd love to try this! Yours is looking great so far. I can't wait to see it all finished! Good on you Lea, I think that is fantastic, x can't wait to see your 'creations', you are right there work is amazing! what a treat to share in a yarn, a cuppa and learning with inspiring women! Snapshots of August in September!! !